"A dictator is someone who has absolute power or who at least behaves as if they do by bossing others around". This is exactly what the MDC Alliance leader, Nelson Chamisa is turning himself into since grabbing power after the death of the late party leader, Morgan Tsvangirai in February this year. Between 2011 and 2014 party congresses when Chamisa was the National Organising Secretary, he embarked on what he termed "scientific organising". On the outlook, it looked like a noble strategy to win the 2013 elections, yet it was, in actual fact, a vehicle by which Chamisa schemed to parachute himself into power. Together with the then Secretary General, Tendai Biti, they mooted "Agenda 2016" whose motive was to technically remove Tsvangirai from power. However, their plan crumpled like a deck of cards and Chamisa fell from grace to grass. When Tsvangirai passed on in February 2018, Chamisa grabbed power ahead of the then Co-Vice President, Dr Thokozani Khupe in a mafia style even before rigor mortis had set on Tsvangirai's body. He did this by hurriedly convening a pseudo National Executive Committee and National Council which he railroaded to endorse him as the party leader and 2018 presidential candidate. When Dr Khupe tried to oppose Chamisa's shenanigans, she was nearly burnt in a hut at the funeral of Tsvangirai and her vehicle had its wind screens smashed in Bulawayo when the Shakespear Mukoyi-led Vanguard ran amok in the City of Kings and Queens baying for their rivals' blood. 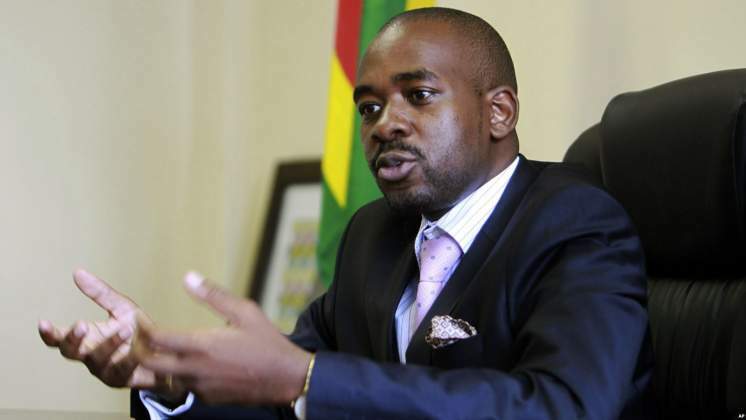 Posting on her Facebook page, Celine Eunice Nyakutsikwa commented that "Chamisa has evidently agreed with himself that the presidency of the MDC Alliance party is for no other man but him, it's a one man show and Congress must only fill other positions except the presidency which is already his. Congress delegates are no longer allowed, by Chamisa to nominate anybody for president, because there is no such vacancy at all. The vacancy was filled during a funeral when Tsvangirai's body was awaiting burial". In a satirical manner, Levison Chambati responded, "Maybe (MDC alliance Secretary General, Douglas Mwonzora must wait for Chamisa's funeral then grab the leadership reigns from there since Chamisa taught us that is how democracy is done in MDC". As if Chamisa's shenanigans were not enough, he is planning to oust Mwonzora from the party as he considers him as a threat to his throne despite declaring that the MDC Alliance top post was not up for contest. In order to strengthen his post, Chamisa is reported to have roped in National Organising Secretary, National Youth Assembly Chairman and Deputy Treasurer, Amos Chibaya, Happymore Chidziva and Charlton Hwende to fight from his corner. Despite his party claiming to be the epitome of democracy, Chamisa chose to break every tenet of democracy by imposing candidates for Local Government, National Assembly and Senate elections. This sowed seeds of discontent among party members as he handpicked his cronies to fill the posts against the people's choices. A typical case was that of Jessie Majome in Harare West constituency who was sidelined in favour of the novice Joanna Mamombe. Chamisa had the audacity of saying Majome was old yet she is only six years older than him. During elections, he sidelined MDC Alliance principal, Jacob Ngarivhume in Bikita East constituency which he handed over to Bornface Mudzingwa whom he thought was a better candidate leaving Ngarivhume clutching at straw for survival. Mudzingwa and Ngarivhume polled 8 542 and 368 votes, respectively, and lost to ZANU PF's Johnson Madhuku who garnered a whopping 10 261. Ngarivhume despite singing for Chamisa, he fell to the latter's dictatorial tendencies. After losing the presidential race, the dictatorship in Chamisa increased as he began to impose Mayors while forcing others to withdraw their bids. Notable cases were those of Chegutu and Masvingo where Mayors Henry Muchatibaya and Advocate Collins Maboke, respectively, were told to step down because they were not his choices. Chamisa wanted Matthias Shumba and Godfrey Kurauone as Mayors for Chegutu and Masvingo, respectively. In Harare, Chamisa made sure that Herbert Gomba landed the Mayoral post. Councillors Ian Makone and Jacob Mafume were vying for the post, and Mafume had already prepared an acceptance speech, but Chamisa had other ideas. True to his attention-seeking behaviour, when Chamisa was invited for dialogue by President Mnangagwa, he spurned the invitation to give the impression of being a big man politically. Now, he is demanding to be appointed the Prime Minister and refusing to take up the post of Leader of the opposition in Parliament, which President Mnangagwa had suggested. In early July 2018, Chamisa led thousands of his supporters demanding electoral reforms from the Zimbabwe Electoral Commission (ZEC) Chairperson, Justice Priscilla Chigumba. Instead of diplomatically engaging Justice Chigumba, Chamisa was street-childlike shouting in the ZEC lobby "We are not moving from here. I can tell you now and we are going to start the process that we want. If they want to kill us, they can call in the army with all kinds of guns. You guys are not serious. We gave notice to Chigumba that we were coming here. We told Chigumba we are coming and you can't send us away. Where did she go?" In his dictatorial tendency, Chamisa wanted ZEC officials to capitulate to his demands. To show his frustration, Chamisa shouted "Do you know this place can be chaotic if we call people in". The electorate was right by handing victory to President Mnangagwa. Who in his right mind would vote for such an individual for Presidency when he behaves like a bull in a china shop when things don't go his way?